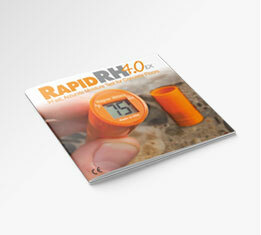 Step-by-step instructions for correctly installing and using the Rapid RH® 4.0 EX. 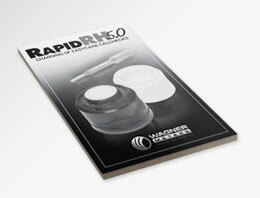 Discover how the Rapid RH 5.0 is different than the standard Rapid RH 4.0 EX and if it is right for you. 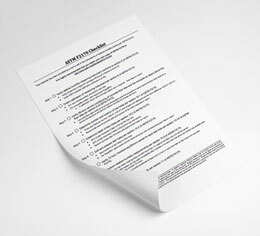 For your convenience, a condensed step-by-step outline of how to install and conduct a Rapid RH® test is provided here. For complete and detailed instructions, please consult the manual for either the Rapid RH® 4.0 EX or Rapid RH® 5.0, based on the Rapid RH® system that you use. Correct hole depth and hole diameter are important in complying with the ASTM F2170 standard. Drill a hole in the concrete slab to the required depth using a rotary hammer drill and a ¾”-diameter masonry drill bit. 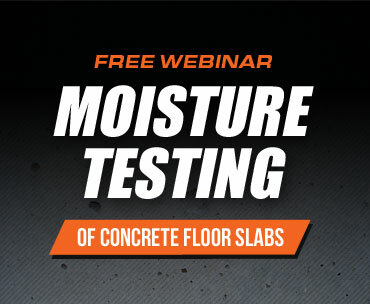 Per the ASTM F2170 standard, drill the hole to a depth equaling 40% of the slab’s thickness for slabs that are drying from one side, or 20% depth for a slab drying from two sides. For fast drilling and clean-up in one easy step, Wagner Meters recommends the Hilti TE-CD Hammer Drill Bit. This is a high-quality drill bit that is long-lasting and gives you a 100% clean concrete hole prior to placing your Rapid RH® Smart Sensors. The Hilti drill bit is very convenient to use, plus it saves you time and money because you effectively skip Step 2 below. Attach the vacuum attachment to the straight extension of a shop vacuum cleaner hose* and thoroughly vacuum up the dust in and around the hole. Next, insert the wire bristle brush into the hole. Turn the brush several times to loosen pulverized concrete from the walls of the hole. Vacuum again. Repeat this step twice to ensure no loose concrete particles remain in the hole. IMPORTANT — Correct Diameter and Hole Uniformity: Use the ¾”-diameter section of the black Smart Sensor Insertion Tool as a diameter and uniformity gauge to ensure a correct and uniformly round hole. Not performing this step may cause damage to a Smart Sensor when attempting insertion. *The vacuum attachment may require an adapter depending on vacuum model. First, be sure you choose the system of Rapid RH® Smart Sensors that makes the most sense for your application. Wagner Meters offers both the Rapid RH® 4.0 EX, for ease and simplicity of use, and the Rapid RH® 5.0, for those who prefer a reusable RH sensor. Each Smart Sensor pack includes ten (10) short (0.4”) extensions that can be inserted into the Smart Sensor barrel to enable use in thicker slabs. Adding one insert extends the Smart Sensor barrel length to 2” for testing 5”-thick slabs to the 40% depth. For all installations, take the Smart Sensor directly out of the package, and with no extensions installed, insert the Smart Sensor into the hole using the insertion tool with the cap placed atop for ease in pushing down on the insertion tool. Push down on the insertion tool with the cap to force the Smart Sensor down inside the hole, “seating” it at the bottom. Once installed, for 1.6” depth holes (40% of 4”), insert a protective cap into the top of the Smart Sensor base sleeve, and push down to the concrete surface. Or, if testing in thicker slabs, assemble the proper number of extensions, and with the protective cap inserted into the topmost extension, push down the extensions and cap into the hole to the concrete surface, until fully seated on the Smart Sensor, completing the installation. Caution: NEVER use the Easy Reader to install the Smart Sensor. When ready to take readings, remove the protective cap from the Smart Sensor. Insert the Rapid RH® Easy Reader firmly until it comes fully into contact with the bottom of the Smart Sensor. 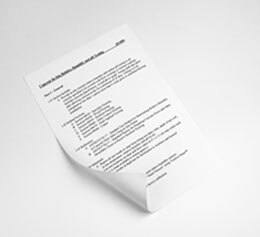 Hold the Easy Reader in place until the first relative humidity (RH) reading appears on the screen (about three seconds), then immediately remove the Easy Reader. The display will toggle back and forth between the RH value (when the cursor is next to the %RH symbol) and the temperature value. Once the Easy Reader is removed from the Smart Sensor, the readings from that Smart Sensor will continue to display for approximately 5 minutes or until the Easy Reader is reinserted into another Smart Sensor. After removal, wait at least 5 seconds before inserting the Easy Reader into another Smart Sensor. After the initial equilibration has been reached per ASTM F2170 requirements, subsequent readings can be taken instantly. If future testing is needed, replace the protective cap by snapping it back into the Smart Sensor. Record readings on the enclosed report form in the spaces provided for information required by ASTM F2170, including the date, time, %RH and temperature. 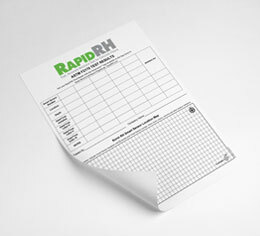 Or to enjoy added convenience and data integrity, be sure to check out the new Rapid RH® Smart Reader and the DataMaster™ app. When paired with your smartphone or another mobile device, they offer you a powerful array of read, record, and report functions. 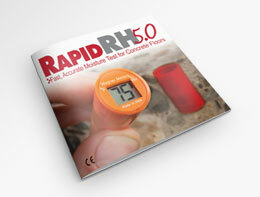 Once you have obtained RH readings, you’ll need to evaluate the slab’s readiness for the flooring installation. Visit www.rhspec.com for links to various finished flooring manufacturers’ installation guides and their RH thresholds. For additional questions related to what RH levels are appropriate, please contact the manufacturer of the product to be applied to the concrete slab. To extract the Smart Sensor only, simply insert the metal end of the Smart Sensor Extraction Tool into the Base Sleeve. Slowly turn the tool counterclockwise until it drops into the “slots” of the Smart Sensor then turn tool counterclockwise until it stops. At this point, gently turn the tool counterclockwise while pulling up. When ready to obtain additional readings, you can just reverse the above removal process to reinstall the Smart Sensor into the Base Sleeve. Using the convenient hooked extraction tool, you will be extracting the Base Sleeve and Smart Sensor. To extract the Base Sleeve with Smart Sensor, put the hooked extraction tool down into the Base Sleeve, seat the hook into the inside of the sleeve and pull up quickly and firmly. The EasyCare CalCheck® is used to verify calibration of your Rapid RH® 5.0 Smart Sensors. 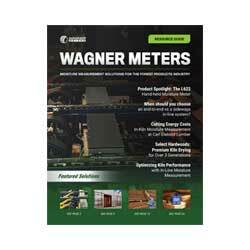 The ASTM F2170 test standard calls for checking sensor (probe) calibration 30 days before use. It is recommended that you plan your routine calibration checks such that you always have verified sensors before you go on a job to do testing. NOTE: For best precision in this calibration check process, it is highly recommended that you use the Smart Reader/DataMaster™ app combination to check calibration. Manual checks can be done with the Easy Reader or Smart Reader/DataMaster™ app combination, but some manual correction may be necessary. If results come back that a Smart Sensor is not within calibration, do not be immediately alarmed. In most cases, it is likely that the sensor is OK, but that the EasyCare CalChecks® and/or sensor is just not currently equilibrated. Allow a few more hours of time for equilibration to occur. 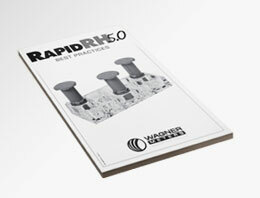 Certain practices, such as calibration checks, that must be performed with the Rapid RH® 5.0 sensors do not apply to the 4.0 EX version that many users are most familiar with. For this reason, when using reusable Rapid RH® 5.0 sensors, be sure to consult our Rapid RH® 5.0 best practices document: Rapid RH® 5.0 Best Practices and Charging of EasyCare CalChecks®. If future readings are no longer needed, skim-coat the hole with a cementitious patching compound compatible with the flooring manufacturer’s installation instructions. Here are several useful resources about the Rapid RH® that you’ll want to check out. 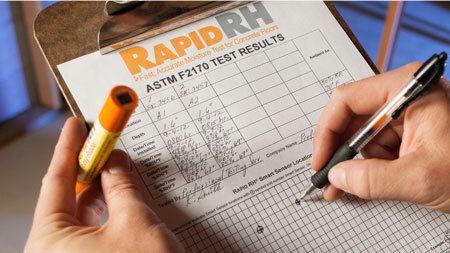 These give you the information you need to be sure you are using the Rapid RH® system correctly and getting fast, accurate moisture testing of concrete floors in full compliance with the ASTM F2170 standard.